I'm holed up in my Korean hostel, the room itself like a bunker 3/4 underground with a high slit window for light and air. I caught a cold, so it's ramen soup and peace and quiet until I'm ready to head out again. The hum of the refrigerator and this window to the interweb are all I have for company. Even if I wasn't up for exploring, I did have a pleasurable afternoon at the neighborhood sauna. I highly recommend going to a jjimjilbang when in Korea--it's basically a sauna with extra rooms for hanging out. After you scrub down and sit in the hot bath or sauna room, you can change into a pair of shorts and t shirt that they give you and head to the community room. It's a huge room with reed mat floors and under-floor heating. Small rooms-within-a-room include the "Ice Box" at 1 deg. C and straw-mat floored rooms ranging from 55 C to 85 C (I could only last 30 seconds in the latter). Koreans go to the jjimjilbang to catch some rest--some even stay the night, as it's open 24 hrs. There are massage chairs and foot massage machines, only 75 cents for 10 minutes. There's a snack bar, computers, even a small restaurant, and a DVD player showing the latest awesome Korean music videos. So this day off from exploring has given me some opportunity to focus on research. My main subject of study in Seoul is Yongsan Garrison, one of several joint American/Korean military bases in the country. Yongsan means Dragon Mountain and was established by the Japanese though I've read accounts of ancient armies using the site as a military camp. What makes this base unique for my study is that it is 630 acres of militarized land right in the middle of Seoul. About 8000 US military personnel operate here and thousands of Korean civilians work for the US Military. Many of the soldiers and their families live off base, blurring the edge between military and civilian space. A military base is really a city within a city, complete with post office, shopping mall, hotel, etc. It is the ultimate gated community. So when it was announced in the 90's the base would re-locate, you can't imagine how anxious Koreans were to have their land back. I should be careful with this term though because the Korean government still owns the land. The United States is a tenant with rights defined under the SOFA , Status of Forces Agreement. It is ultimately up to the Korean government to decide when the base will close--that is dependent on the construction of new facilities south of the city at Pyeongtaek, which is slated to cost the government 3 billion dollars. That money has to come from somewhere. Plus there was a great deal of protest against the military relocating. The cost of relocation is known dearly to 43 families who lost their farmland, only 2 of which were able to purchase new land with the government compensation. The situation is complex and merits a lot more explanation, but what I want to focus on is how the Koreans view Yongsan Garrison now and what their plans are for the future. I've met with a master planner who briefed me on the various plans for Seoul at large which impact the future of the site. A major aspect of the plan is a north-south green belt which will connect Bukhansan National Park to the north of the city with Namsan, a hill just above the base. This north-south greenbelt seems dubious to me, merely a spur to development and not really generating an 'ecological' connection. I think the creatures will prefer to stay in the hills and forests. Regardless, the final link in the belt is impeded by the military base. Given the official decision to convert the base into a park, it will connect the greenbelt to the River Han. I've walked most of the perimeter, including several more miles than the actual perimeter because of dead-ends against the wall. Even a subway line jogs around the base. It is difficult to see right now with the given road infrastructure how the land will be opened up to the rest of the city. Only Itaewon street, my least favorite place in Seoul, is connected to the base. There you have your shops selling American-style clothes, plus bars and restaurants which cater to the soldiers and Koreans who are craving an 'International' experience. An international ideas competition for Yongsan Park was announced in last November's Landscape Architecture but was quickly cancelled, the reasons for I'm not quite sure. Two days ago I met with a professor of landscape architecture at SNU who worked on the park's competition brief. He said it may be re-announced this year. In any case, nothing is going to happen for a while on the land, as the US troops will stay until 2015. 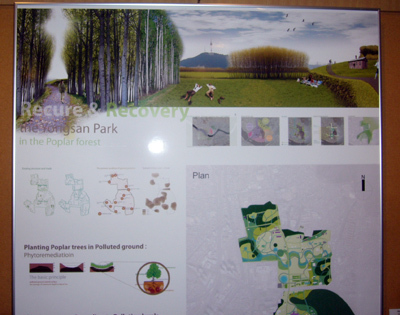 The precedent is set for Yongsan in terms of conversion into a park but questions remain. Most central to my interest is: what do you do with the residual military structures and landscape? From my meetings I understand that Korean people want it wiped completely clean and super-green. Real estate offices around the area present huge maps on their storefront windows of the region with renderings of a park greener than broccoli. Green sells. The Koreans are acutely aware of the imperial associations with this site, dating back to the Japanese occupation. I can understand their wish to move past this history, but I'm not convinced that total erasure is the answer. Besides, it won't be possible. It is likely that the US Military will get to keep the Dragon Hill Lodge and a heliport which already begins to carve out a significant chunk of the land. The site of the future US Embassy lies at the northern edge of the base on what is now Camp Coiner. Plus a major arterial road bisects the base--burying this road is an expensive option but probably necessary if Seoul wants to have a continuous "Central Park" . There is an ecological question which has not only to do with soil remediation but also the larger plan to connect the park into the city's ecology. The landscape architecture professor led a studio which proposed alternative ecologies, not just pure green-space. The student projects included river restoration and farmland (though there is sad irony to this proposal, given the Daechuri incident mentioned above). And of course there is the money question. 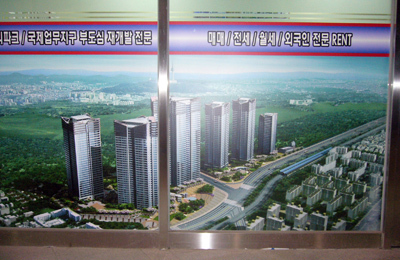 The city wants a shopping mall component, likely to be underground (Koreans love their underground shopping malls). Around the park area there are already plans for an international business district which will link into and feed from the park's infrastructure. I'm not sure how this equals the 3 billion price tag for moving the US troops, and so I'm skeptical as to how public and how "natural" this park is going to be. The Yongsan Park is worth paying attention to, both for the future of Seoul and in terms of demilitarization. If they go through with the competition, it could stir quite a bit of interest given its size and international visibility. There is still political tension in the air, and many parties with their cards in the game. It would be an amazing thing to behold, a clean conversion from military base to open park space, but this post-military explorer has his doubts. Given the competing financial, civic and foreign/military interest it does seem unlikely that the park will be a purely "Green" park. Although given it size and potential if they do hold a competition seems like it would be one to watch! I feel your pain bud, caught a cold in Alberobello, Italy that took me out for about a day and a half now. I think its getting better so hopefully I'm on the up and up. Hope you feel better fast! Your entry is the top search result in Google News for "Central Park". dude archinect rocks!! thanks for the clipping Paul. p.s. I'm on base at Yongsan right now... I met a retired Seargeant Major the other day who got me on. it's incredible how the sky and the city opens up once you walk on--everywhere else in Seoul is loaded with skyscrapers and you can't see more than two blocks away. i really enjoyed my brief sojourn in korea. i really miss the mondu.